Avril Thomas, born in Malaysia, has enjoyed a lifetime of drawing and until 1996 it was essentially was a private pursuit. Whilst living in Queensland Avril’s talent was recognised and was asked to teach. 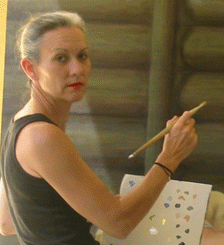 On returning to South Australia she has participated in many joint and solo exhibitions. Her main focus is portraiture in charcoal, graphite, pastel and oil, all with a tonal realist style. Avril’s works can be found in Hong Kong, U.S.A. as well as round Australia in corporate and private collections. The portrait of Alexander Downer, “The Minister from Downunder” for the 2005 Archibald Prize, made Avril a finalist. Commissioned by Adelaide University School of Medicine to paint and draw key people in the Medical profession for the 125th Anniversary of the school exhibition another marathon effort – “A day in the life exhibition” 59 images were created for this exhibition with artist Meg Brassil. Avril Thomas of a Member of..